The National Science Foundation (NSF) originally established the BIG DATA @ NSF webpage to describe the portfolio of big data and data science activities at the Foundation, encompassing research, research cyberinfrastructure, education and training, and capacity building. A key program has been the Critical Techniques, Technologies and Methodologies for Advancing Foundations and Applications of Big Data Sciences and Engineering (BIGDATA) program; launched in 2012, this program has contributed significantly to the formulation of the new field of data science. With data science now established as a discipline in its own right, NSF is transitioning investments in the BIGDATA program into (i) a new phase of larger and more targeted programs as part of the NSF-wide Harnessing the Data Revolution (HDR) Big Idea, and (ii) increased investments in core programs related to BIGDATA. While NSF plans no further competitions under the BIGDATA program, NSF anticipates supporting many new and continuing programs that fund innovative, interdisciplinary research in data science. You are therefore encouraged to visit the HDR webpage for the latest information about NSF’s Data Science investments. The information below will remain available for archival purposes; however, we do not anticipate further updates here. NSF research programs in Big Data cover algorithmic, statistical, and mathematical foundations of data science; new techniques, technologies, and methodologies, including hardware and software approaches; and innovative uses of data for scientific discovery and action. 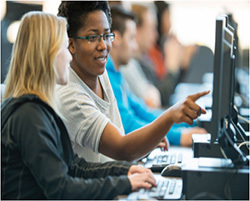 The BIGDATA program seeks novel approaches in computer science, statistics, computational science, and mathematics, along with innovative applications in domain science. The goal of the CDS&E program is to identify and capitalize on opportunities for major scientific and engineering breakthroughs through new computational and data analysis approaches. 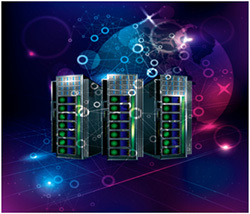 NSF investments in cyberinfrastructure contribute to a national computing ecosystem that supports high–performance computing as well as data–intensive computing in order to advance discovery across all areas of inquiry stimulated by big data. DIBBs investments enable new data–focused services, capabilities, and resources to advance scientific discoveries, collaborations, and innovations. The CC*DNI program invests in campus–level data and networking infrastructure and integration activities tied to achieving higher levels of performance, reliability and predictability for science applications and distributed research projects. Science–driven requirements are the primary motivation for any proposed activity. 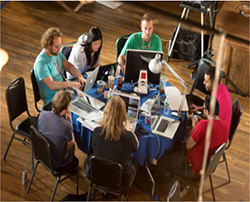 With the Big Data phenomenon permeating every facet of society, NSF recognizes the pressing need for education and training programs that equip future generations with skills in both computational thinking–the ability to develop computational abstractions of real–world phenomena–and inferential thinking–the ability to arrive at sound conclusions from data. The NRT program is designed to encourage the development and implementation of bold, new, and potentially transformative models for STEM graduate education training. This program includes a priority area in Data–Enabled Science and Engineering. Big Data problems are characterized by multidisciplinary collaborations involving participation by multiple stakeholders. NSF seeks to accelerate the interdisciplinary Big Data research ecosystem by funding projects specifically related to community building. NSF has funded four regional hubs for data science innovation that catalyze multi-sector interdisciplinary partnerships for activities to address regional challenges. The BD Spokes solicitation extends the BD Hubs network by establishing multi-institutional and multi-sector collaborations focused on topics of specific interest to a given region. 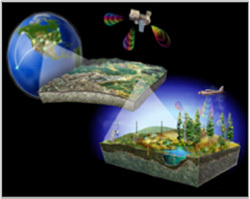 NSF seeks transformative concepts and approaches to create integrated data management infrastructures across the Geosciences to address the multifaceted challenges of modern, data-intensive science and education. May 24-26, 2016, "XLDB 2016: Conference on Extremely Large Databases", Palo Alto, CA. March 21–22, 2016 "Midwest Big Data Hub All-Hands Meeting", Rosemont, IL. March 3, 2016 – NSF - R.V. Guha – "Empirical Modeling of Complex Systems"
January 28, 2016 – NSF - Michael I. Jordan - "Computational Thinking, Inferential Thinking and Data Science"
December 10, 2015 – NSF - danah boyd - "Data Science: Making Sense of Found Data"
November 30, 2015 - NSF - "Big Data Regional Innovation Hubs: Establishing Spokes to Advance Big Data Applications"
May 20, 2015 – NSF -Kathy Yelick - "More Data, More Science and......Moore's Law?" May 1, 2015 – NSF -D.J. Patil - "Data Science Seminar with DJ Patil, Chief Data Scientist for White House"
April 9, 2015 – NSF -Candace Thille - "The Science of Learning, Technology, Big Data, and Transformation in Education"
April 3, 2015 - NSF -"Big Data Regional Hubs (BD Hubs) Program Webinar"